Visit the park that started it all! America's first National Park welcomes hundreds of thousands of visitors yearly all clambering to explore the vast wonder of the land. In addition to the magnificent landscape, a visit to Yellowstone isn't complete without checking out local eateries, stores, and souvenir shops! All uniquely Yellowstone and representative of the great American wild west, you won't want to miss out. If you are interested in visiting the Yellowstone National Park, we have what you need all in one place. 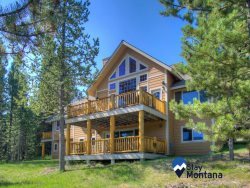 Browse our resources below to start planning your Montana dream vacation. If you need additional assistance please contact our office we are happy to assist you. Greatly influenced by altitude, Yellowstone's climate fluctuates from mountaintops to valley floors, so be sure to pack accordingly! Precipitation is variable though afternoon thunderstorms can be expected most often during the summer months. And be wary, snow can occur any month of the year but is most common between November and April with 150 inches (12.5 ft) annually surrounding Yellowstone Lake. Double that figure for higher elevations! The best times to explore the park are before and after the summertime heat and crowds, typically April-May and September-November. Though springtime can be unpredicatble in terms of weather the park is coming to life as the snow melts. Summertime allows for more hikes and access to areas that are typically snow covered even well after wintertime ends. Note that summer nights are still cold in the park so be sure to pack warm gear too! Winter in Yellowstone is not for everyone, with high snowfall totals and low temperatures the park is still accesible however by snow cat and snowmobile. There are many options when traveling to Yellowstone National Park. From regional airports to ground transportation, you'll get exactly where you need to go. If you need assistance arranging transportation be sure to contact our office for guidance. Below find our most frequently asked questions about Yellowstone. Find more information on surrounding areas here.